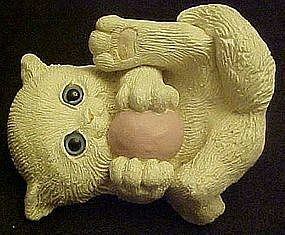 This cast art figurine is a white kitten with big blue eyes and she is on her back playing with a ball. Measures 2 1/2" tall and is 4" long. It does have a signature on her backside but it is hard to read because it is in her (fur) area. No chips or repairs. A cute item for all you cat lovers out there!